400 Words That Work - Teacher's Edition. 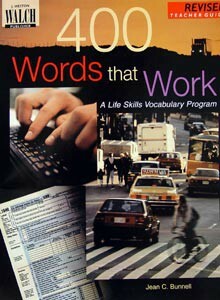 Use along with "400 Words That Work" Student Edition (Item #0581). This teacher guide gives you complete instructional materials that include detailed teaching directions, extension activities, help for ESL students, and answer keys for each lesson. These relevant, real-life activities provide the kind of repetition and review your students need to succeed. Softcover. 64 pages. From Walch Educations.